Mr.Tri-ang, Tom Caren, in his private Tri-ang museum. Thanks to all his information and a lot of photo's we were able to start this web site. Tom on behalf of all Tri-ang collectors thank you very much for your indispensable help! range of vehicles in the series. unusually a working cement mixer to start the series off. The Tip lorry has a simple lever-operated tip body and an opening tailboard. This mechanical mixer revolves as lorry moves along. It is fitted with controls for emptying the barrel. The barrel can tip to shoot the "concrete" through the rear trough. It then had a 4-wheel Express delivery van, breakdown lorry, fire engine,farm lorry, petrol tanker and a series of 4 articulated lorries added to the range. Later on in its life it had a 6 wheel chassis included which had a series of 4 different bodies added.The Diesel has a typical Triang decal "made in England" on top of the cabin. and a toolbox with tools. The Diesel Farm Truck was supplied with six pigs, moulded in plastic. This Diesel Milk truck is exactly as the above Farm truck. In stead of the pigs, this lorry was supplied with 8 milk churns. Don't let your children play with these churns as they were made with lead ! The Shell tanker was supplied with a water tank with a filler and a drain pipe with tap. Thisle had their own colour policy, like this unusual yellow Diesel tanker. When this engine is pulled along, a fire bell automatically rings. The escape ladder can be slewed elevated and extended. when the rubber dome on chassis is pressed. an extra "Tri-ang" decal on the top of the cabin. 6 wheel trucks, let's have a look at these lovely trucks ! 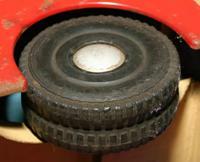 The wheels of this serie are total different with the regular Tri-ang wheels. 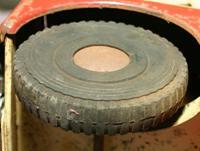 Tri-ang used the same wheels for the first Double decker bus. The hubs on the Diesel wheel were made of a bad quality. To restore old furniture one uses large nails with a diameter of 27 mm. These nails are a great replacement for the Diesel Hubs. A hub set is available at our replacement site. Tri-ang Diesel Mechanical Horse Series. Tri-ang New Zealand produced the same truck. simplified front panel pressing and radiator grille. at the right a Merton. These truck or very simalar to the Tri-ang Diesel series. This large British made "Toytown Truck" Removals Van is similar to the Triang vehicles, with a similar cab to Triang Diesel Series, . 70cm long. The low loader truck of the same factory. turned up in 2010.